A.C. Wise was born and raised in Montreal, and currently lives in the Philadelphia area. 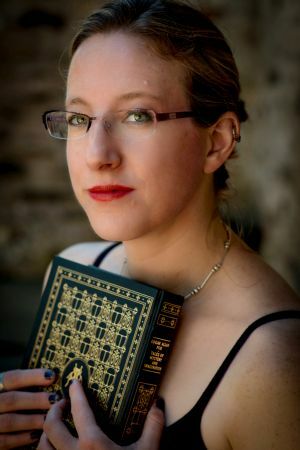 Her work has appeared in publications such as Clarkesworld, Tor.com, Shimmer, and the Year’s Best Dark Fantasy and Horror 2017, among other places. Her collection, The Kissing Booth Girl and Other Stories, was a finalist for the Lambda Literary Award, and her story “The Last Sailing of the Henry Charles Morgan in Six Pieces of Scrimshaw (1841)” won the Sunburst Award for Excellence in Canadian Literature of the Fantastic. Her collections, The Ultra Fabulous Glitter Squadron Saves the World Again, and The Kissing Booth Girl and Other Stories are both published by Lethe Press. A novella, Catfish Lullaby, is forthcoming from Broken Eye Books. In addition to her fiction, she contributes a monthly short review column, Words for Thought, for Apex Magazine, and the Women to Read and Non-Binary Authors to Read series to The Book Smugglers. Contact the author at a.c.wise@hotmail.com or find her on Twitter as @ac_wise. She is represented by Barry Goldblatt at BG Literary. Just read your story “Still Life” in the Daily Science Fiction emailer. A perfectly brilliant piece of literature that works on many levels. Bravo! Thanks, Richard. I’m so glad you enjoyed it! I just read Still Life on the DSF page. updated version. Better in so many ways. fiction that I have found that was especially good. entertained by good science fiction. (beammeuppodcast.com). All very low key. News, views reviews and stories. like to have a bio as well to add to the story) and thats it. Thanks for your time and great fiction! I have begun reading Mz Wise’s very moving tale “Still Life” on WRFR our community radio station in Rockland Maine. Anyone outside the listening area can listen in on wrfr.org. The program starts from 4 and runs until 5 – Saturdays. If you would rather not be tied down, I do put up a podcast file of each program. on Beammeuppodcast.com. Part 1 is available in episode 312. Enjoy and thank you A.C.
I’m sure you’re way past simple reader praise but I just listened to your story last girl theory on pseudopod and I just wanted to tell you how much i enjoyed it. It grabbed me right away and never let go. I liked the open endedness of it very much. Thanks for the great read (listen). Hi, Joseph. I’m so glad you enjoyed Final Girl Theory! Thanks for stopping by! Hi, I’ve watched! Last Girl Theory last night and liked it very much. Hope it’s made into a movie one day. If that happens, which movie(s) you’d think come closest as stand-ins for the Kaleidoscope? I’m so glad you enjoyed Final Girl Theory. I can’t really think of any movies that would make good stand-ins for Kaleidoscope. Ideally, they’d make a movie within a movie, if it ever did become a film. Thanks! I just finished Venice Burning in the Future Lovecraft anthology and wanted to say what an amazing story it is. The imagery is simply wonderful, and having finished I immediately came to find out where I could get more of your work. Thank you for an excellent read! Hi, Cat! Thank for the kind words regarding Venice Burning – I’m so glad you enjoyed it! I’m particularly fond of that story. It’s going to be podcast by Pseudopod sometime next year, and I can’t wait to hear what they do with it. I also really enjoyed Final Girl Theory and the “Bucklin Mills” interview. I think I still have the “Buck, Mills, Berry, Me” poster somewhere. Great reference. I’m so glad you enjoyed Final Girl Theory and Bucklin Mills. I wondered whether anyone would get the Buck, Mills, Berry, Me reference. I’m glad someone did! Loved Where Dead Men Go to Dream. Just read it Weird Fiction Review. It really is a brilliant story. Cheers. Thanks, Mike! I’m so glad you enjoyed Where Dead Men Go to Dream. “Still Life” is a great story, AC … evocative, visceral. I enjoyed they way you engaged the sense of touch throughout the telling. And now … I’m on a hunt for your other work. I read earlier pieces but there are many gaps to fill. I’m looking forward to the journey. Thanks so much. I’m so glad you enjoyed it! Hopefully you enjoy the other stories as well. Ms. Wise, if you weren’t already aware, during the June 11 podcast of Lovecraft.ezine Joe Pulver singled out your story “The Paradox Collection” as the best in Tales from the Miskatonic University Library. His remarks are at about 1:12 of the podcast. Sorry, that was Rick Lai who made the comment (that’s what I get for listening without watching the video portion). Thank you so much for letting me know. That’s wonderful to hear! I just read “A catalogue of sunlight at the end of the world” from the best of science fiction of the year vol 3. Having read the previous volumes as well I can say without a doubt your short story was my favorite. In just a few pages I felt like I connected with the characters in a way sometimes a full novel fails to do. Your skill as an author had me reminiscing my fond memories with sunrises/sunsets just like the protagonist. Great work overall, can’t say it enough. Can’t wait to read more of your work. I’m delighted to hear you enjoyed “A Catalogue of Sunlight at the End of the World”. It’s one of my personal favorites, so I’m always happy to know other people are enjoying it!